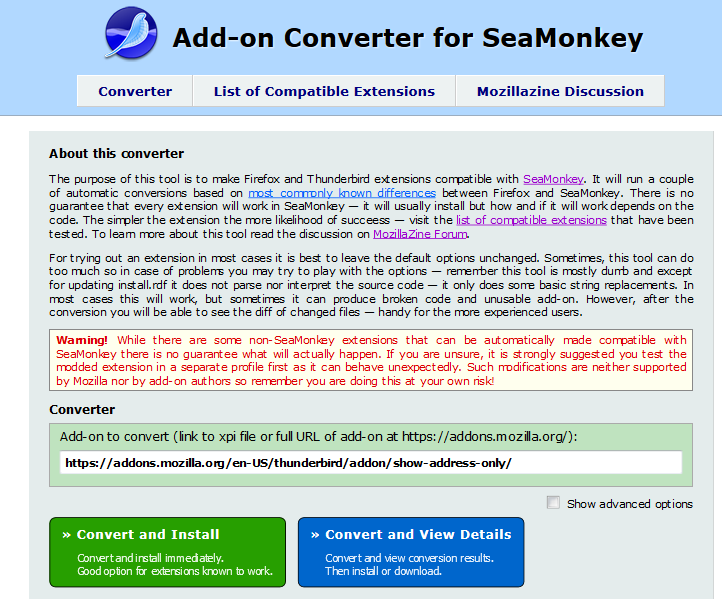 Since 2014 we have had the Firefox & Thunderbird Addon-Converter for SeaMonkey. This great tool (already mentioned in the official project blog) converts add-ons written for Thunderbird and Firefox, so that they can be used with SeaMonkey, either. Now we have an additional tool of the same author (Lemon Juice) available for public download from sourceforge.net. The add-on dramatically eases converting of add-ons for usage with SeaMonkey. After it has been installed the add-on AMO Browsing for SeaMonkey will add important information to the add-on download pages on AMO (Addons.Mozilla.Org) and will allow conversion with the Firefox & Thunderbird Addon-Konverter for SeaMonkey with very few mouse clicks. Additionally some parameters for conversion will be preselected. AMO Browsing for SeaMonkey adds context-sensitive information and functions, for example a test whether a SeaMonkey specific version of the add-on is available (example: Show Address Only) on AMO. The link “Convert this add-on here” will transfer the URL of the add-on-AMO-page to the Converter and preselect suitable conversion settings. A click on the green button will install the add-on immediately after conversion. A click on the blue button will show detailed conversion information and a link for installation. Before you install the add-on you should follow the link to the add-on compatibility table, where you can check whether already experience with the converted add-on does exist.If you know new information (because your converted add-on is missing in the table or because your experience differs from that in the table) please help other users and share your experience. [ ] my non-default conversion parameters: …, …. Please send information to me, I will add your information to the compatibility table. Be aware that by default AMO only will list SeaMonkey-add-ons if you use SeaMonkey for browsing. To reach Firefox– and Tunderbird-add-ons you will have to replace the string “seamonkey” in the URL in the SeaMonkey Location Bar by “tunderbird” or “firefox”. The suggestions below the search string input line also will show FF and TB add-ons. And finally 2 warnings: AMO rejected the add-on because of security concerns, currently it’s still not clear whether these concerns are cogent for the real use of the AMO Browsing Add-On. For details please see the comments in Bugzilla. An pleas do not use the Add-On-Converter to convert Language Packs. That can’t work and might cause serious problems. I have been using the AMO Browsing for SeaMonkey add-on and the converter for several week without problems, but as usual: your use these tools on your own risk, without any warranty! The SeaMonkey-Project is living thanks to contributions of the Community, manpower and donations. Any amount is appreciated (suggestion: 5 €/year or Flattr). Possibilities for donation: to the SeaMonkey e. V. or via my private campaign. Backgrounds concerning the reasons why I currently do not recommend to donate for the SeaMonkey e. V. you find here in the unofficial German SeaMonkey News Blog, the posting in the official SeaMonkey Blog has been deleted. With a click on the pile of money picture at the right you will reach my private donation campaign (not under responsibility of the SeaMonkey-Project or of mozilla). So, if you like the browsing add-on or oyu simply want to help to improve SeaMonkey, please donate. Plans how to use donated money will be published and discussed here in the Blog, starting in April 2016. Categories: News, Tipps and Tricks | Tags: Add-OnX, Addon, Bugzilla, Community, converter, donate, donation, help needed, News | Permalink. Big problem: Instead of preferences dialog a XML warning will appear. Without knowing good tricks your user profile will be lost! So again: DO NOT CONVERT LANGUAGE PACKS! In between the problem has been solved. After conversion of a Language Pack a very visible warnigng will appear. And on author’s Github page now an installable .xpi of AMO Browsing for SeaMonkey is available, so that it’s no longer expedient to download it from soureforge net. In this case usually helps Safe Mode. If the browser is so broken, that you cannot even restart in a safe mode, find “prefs.js” file in your profile, open it with any text editor and change “general.useragent.locale” parameter value to “en” (or “en-US”, if first variant doesn’t work), this will switch browser’s interface to default English locale, so that you’ll be able to run it again.